At work, I spend a good chunk of the day outside. Since I'm fairly pale and burn quickly, sunscreen is an absolute must. Previously, I've been using Badger's sunscreens, but I'm not crazy about the whitecast they leave, so I thought this summer I'd give a new sunscreen a try. Eco Logical sunscreens are the newest offerings from the Soleo Organics team. They offer face, body, and baby sunscreen, as well as a moisturizing skin mist for after sun exposure. 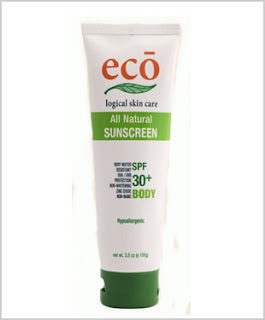 Eco Body sunscreen is packaged in a pretty standard squeeze tube. I definitely feel like they use bigger tubes than necessary for the amount of sunscreen they contain, because both tubes I bought seemed only about half to two thirds full right from the start. (They were sealed, so it wasn't that they were partially used or anything.) Not a huge deal, but in addition to the extra packaging being worse for the environment, this is a bit of a nuisance because it makes it harder to get sunscreen out right from the start. In terms of sun protection, Eco Body sunscreen is top notch. Even without reapplying as often as you're supposed to (reapplying every 2 hours just isn't feasible at work), I've only ended up with a slight tan this summer. No burns in sight! I can't definitely say how water resistant it is, but I've swum and not reapplied afterwards (not ideal, I know), and still been fine the rest of the day. It is very slightly whitening, but that disappears after 5-10 minutes or if you just keep rubbing it in. I also love that this sunscreen is pretty much non-greasy. It soaks into my skin and dries to an almost powder like finish within a couple minutes. I've also been using it on my face, since I don't tend to buy a specific face sunscreen, and it works okay for that too. Applying makeup on top can be iffy - it doesn't always want to work with my powder concealer unless I wait a good while before applying it - something I don't usually have time to do in the mornings. I also started getting some dry/flaky skin on my arms and legs after about two weeks of wearing this sunscreen. I'm not 100% sure I can blame this on the sunscreen, but it seems like a definite possibility. Eco Body is a pricey sunscreen, at close to $25 for 5.3 ounces or $17 for 3.5 ounces, but if you're looking for a natural sunscreen with great sun protection, I think it's worth it. I really like that it's virtually non-whitening, not greasy, and is fragrance free. I'm pretty sure this sunscreen has at least played a part in whatever has been drying out my skin, but if you are someone who only wears sunscreen occasionally, as opposed to every day, I don't expect this would be an issue. Still, next time I think I'll try Eco's Baby sunscreen, which is supposed to be more moisturizing. I may also invest in their Face sunscreen, since I expect it would perform better under makeup. Thanks for the review, I have unfortunately not had a chance to test our natural sunscreens yet! I'm intrigued to know what your job is where you get to be outside? Thanks for linking me in your side bar too!